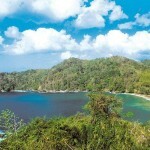 Fly to Caribbean from Germany - air tickets to Trinidad & Tobago €344! Alitalia non-stop flights from Italy to the Maldives from €370 return! German leisure airlines Condor Flugdienst with its HQ in Frankfurt have just released an interesting sale between Frankfurt and exotic Caribbean isle Tobago. Fly from Germany to Trinidad and Tobago in May / June 2019 already for €344. This is for a return ticket including all taxes and fees as well as 20kg checked luggage. Outbound is a non-stop flight while there is one short stop in Barbados on your way back. If interested in this Condor airlines promotional offer you may find the lowest fares in May and June 2019. Very limited travel options are available at this moment. Below you may refer to our booking samples if interested in this deal. Travel dates. You may check here directly with the airline as they offer month´s view. Alternatively you can use Google Flights tool as it is easy to use and gives almost instant result. We recommend to book your hotel rooms in Caribbean in advance. To book your accommodation in Tobago you may use Booking.com or consider following promo codes that offer Otel.com, Hotelopia or Hotels.com. Booking sample of cheap flights to Carribean from Germany – air tickets to Trinidad & Tobago from €344! In this case you would be departing from Frankfurt to Tobago on 7th of May. Your return flight from this exotic Caribbean holiday destination to Europe would take place on 21st of May 2019.